What is a Va Form 10 2850c? This form is used by the United States Department of Veterans Affairs. 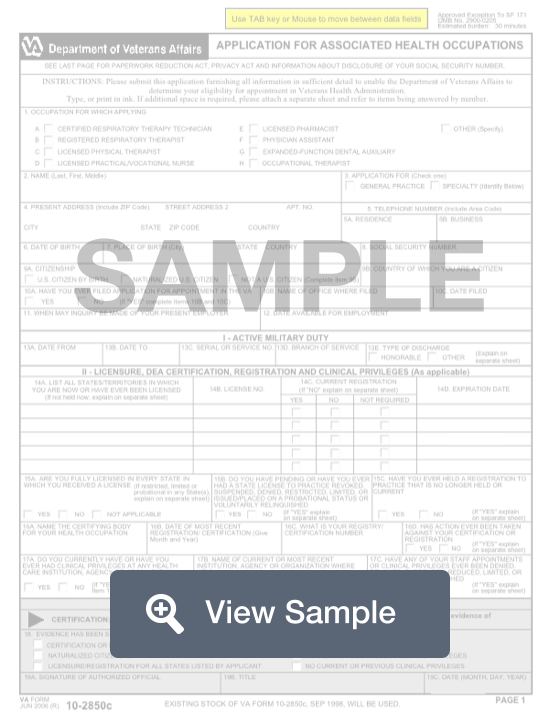 This form is used by the United States Department of Veterans Affairs. The VA Form 10-2850C is known as an Application for Associated Health Occupations. This will be used by someone who is not listed on the other VA Form 10-2850s. This could include individuals who are working as a respiratory therapy technician, physical therapists, pharmacists, or physician’s assistants. This form will require detailed information about the applicant and their experience in the medical field. All information provided will be verified by the Department of Veteran Affairs. You will need to include personal information, education details, work experience, and references. Be specific when you are filling out the form, as this will help improve your chances of being qualified to become a member of the Veterans Health Administration. 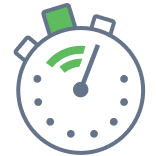 Create a free Va Form 10 2850c in minutes with our professional document builder. The VA Form 10-2850c is commonly used by healthcare workers who would like to be appointed by the Veterans Health Administration and no other 10-2850 form applies to them. If you need additional space, you should attach a separate sheet of paper and refer to the numbers being answered by number. The U.S. Department of Veterans Affairs is conducting this information collection to determine your qualifications for employment. It has authority to do so under Title 38, United States Code, Chapters 73 and 74. OMB Number 2900-0205. The information provided on the form may be released without your prior consent to another federal government, state, or local agency, to the National Practitioner Data Bank which is administered by the Department of Health and Human Services, to State licensing boards, and other appropriate organizations or agencies. Disclosure of your social security number is necessary to obtain the employment benefits that you are applying for. The VA is authorized to ask you for your SSN under Executive Order 9397, dated November 22, 1943.